This overview is written as a tribute to my teacher, Professor Arun Kumar Biswas who introduced me to the discipline of minerals characterisation over three decades back. The focus of the paper is on complementary nature of techniques used for mineralogical characterisation of ores, minerals and, intermediate and final products generated during processing. The subject matter is essentially covered in two parts. In the first part, a general outlook is given based on the research summary dealing with a wide spectrum of materials and processes investigated. The potential and limitations of some commonly used tools/techniques are highlighted. In the second part, specific examples are presented under different themes covering phase identification, quantification of phases, heterogeneity in ores, occurrence of minor elements and their reactivity, mechanically activated solids, and lastly, structure-leachability correlations. The work reported in this paper is outcome of author’s collaboration with several of his mentors, colleagues and associates. The author would like to thank and express his gratitude for all of them, especially, Prof. S P Mehrotra, late Prof. P Ramachandra Rao (formerly Directors, CSIR-NML); Profs. R K Ray and T R Ramachandran (ex IIT Kanpur); Drs. Sanjay Kumar, T C Alex, S Srikanth, B Ravi Kumar, Swapan Das, late Samar Das, T Mishra, (CSIR-NML); and Dr. Pradip (TRDDC-TCS), Prof. Nirdosh K. Khosla (IIT Bombay) and Dr. Arup Gangopadhyay (Ford Motor Company). Support from Dr. K Muraleedharan (Director, CSIR-NML and CSIR-CGCRI) is gratefully acknowledged. An Introduction to Electron Microscopy, booklet available from https://www.fei.com/introduction-to-electron-microscopy/. 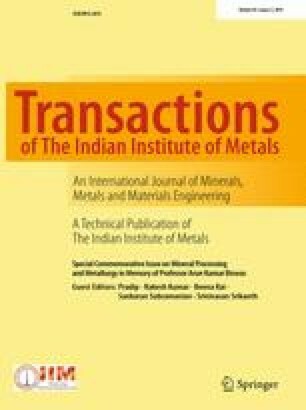 Tammishetti V, Sivakumar S, Kumar D, Rai B, and Pradip, in: IMPC 2016: XXVIII International Mineral Processing Congress Proceedings (ISBN: 978-1-926872-29-2), Canadian Institute of Mining, Metallurgy and Petroleum (2016), 11 pp (www.researchgate.net/publication/309135087_quantitative_estimation_of_minerals_in_iron_ores_using_chemical_assays_and_thermo-gravimetry_analysis_data). Knorr K, Bornefeld M, Analysis of Iron Ore – A combined XRD, XRF and MLA study. in: Conference proceedings Process Mineralogy’12, (ed) Wills B A, MEI – Minerals Engineering International, Cape Town, South Africa (7–9 November 2012) (available from: https://www.researchgate.net/publication/255968460_Analysis_of_Iron_Ore_-_A_combined_XRD_XRF_and_MLA_study). PanAnalytical: XRD Application Note - X-ray diffraction (XRD) for grade control of iron ores (source: http://www.airedale.com/web/file?uuid=82e53530-b45c-404b-b792-8292e12ac97f&owner=00665561-0d44-44d2-970a-86c7e16f7742). Crystallography Open Database (COD), http://www.crystallography.net/cod/. Suhr D D, Principal Component Analysis vs. Exploratory Factor Analysis (SUGI 30, Paper 203-30), http://www2.sas.com/proceedings/sugi30/203-30.pdf.